I just had my birthday this past Thursday. In the broad scheme of things, it really means nothing, but I do thank all the people who took the time to wish me a happy birthday. Also, I want to thank Paul Oates for making sure all the listeners of WLVL knew it was my birthday. However, in my household, my birthday is a big deal. And it has nothing at all to do with my day. It has to do with Christmas decorations. Having a December birthday comes with challenges. Christmas and New Year’s are the biggest holidays in the calendar. When you have a December birthday, it can get lost in the bright, shining star of Christmas. Thankfully, my birthday is early enough that the star is twinkling at the edges. My daughter, Jo, has one of the worst birthdays at December 30th. By that point, people are done with Christmas and preparing for New Year’s. The last thing people want is a party for a little kid. I guess I should let them put up the decorations. They’re excited. And it’s not like I don’t like the decorations. I love driving around at night in December seeing all the lights and decorations that people have put up. 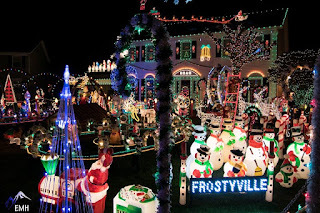 Heck, if I had the time and money, I’d have the house decorated with all the lights and have music playing, with those lights in time with the music. Of course, the music would definitely be Star Wars themed. Just because. Walking by the twin’s room earlier this week, I saw they had put up a small tree in their room. It’s a Looney Tunes tree that my Dad gave us a couple years ago. Patience has decided it’s her tree and decorated her room accordingly. They have lights, too, but they have not put those up yet. Several years ago, I put up a single string of lights on the front porch. We have a very small front porch, especially in comparison to the rest of the house. That single string looked ridiculous. I laughed about it. Even a delivery guy knew which house I was when I ordered food one night. “Oh, I know THAT house!” Maybe if I had more time, I’d remember when it was still warm outside, and hang lights along the eaves. Of course I never remember until it’s too cold to do it. One of the coolest things about our house (literally in the winter months) is a side porch that is all windows. Last year, I had a great idea that we should put our big Christmas tree out there so people passing by would get to see some decorations at our house. It was very cool looking. Today (Saturday), Wendy and Corliss are working out there to get the tree ready to be put up. When I was a kid, I had a basement bedroom. I would decorate the whole thing. So, I am definitely not adverse to decorating. I just want to make sure it happens after my birthday. Of course, by that time, our schedules have jumped into overdrive. It’s not easy to fit decorating into the calendar. Last year, I had the bright idea to buy some of those spotlights to shine on the front of the house. I bought the knock-off brand. They sucked. But I kept them shining on the house long past the holidays. I’m sure it drove the neighbor nuts, but that was not the reason. It had a bunch of different settings for different holidays. I figured I should get my money’s worth and use all of them. Corliss wants to get a blow up Darth Vader decoration with a Santa hat. I would love it. Wendy is adamantly against it. So, maybe it’s not me who isn’t filled with the holiday spirit. Anyone can have a fat man with his pet reindeer. Considering there is a new Star Wars movie coming out this week, it’s only proper that we mix the two so we can celebrate being a Jedi at the happiest time of the year. Maybe next year, I’ll put up some lights on the house in the summer in preparation for the holidays. If I could find some lights that can be changed to fit any holiday throughout the year, I’d buy those ones. I could have red, white and blue flashers for Independence Day. Orange for Thanksgiving. Maybe even green for Arbor Day. Craig Bacon thinks he might put up decorations for his birthday next year, which then can morph into Christmas decorations on the 8th. We’ll have to wait and see.